Hi, everyone. Just wanted to let you know that my family and I had LOADS of fun at the Bitter Creek Western last Saturday. 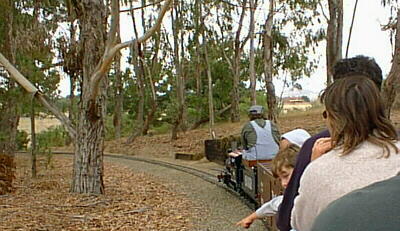 We must have ridden trains at least eight times apiece. We arrived at about 10:20 AM and all rode the first train together. After that, there were more people there so we had to split up and ride different trains. But that was great because we were able to wave to each other at different points along the route. Enough trains were running to result in multiple over/ under train meets at a few spots. The layout is very well designed and landscaped. The view from the long curved trestle out toward a small valley bordering the property is really nice. I was impressed with the realistic way the signals work, and with the real working steam locomotives. Perhaps the only down side was that I was starting to get saddle sore from riding on the cars with wooden benches, so the padded seats on other cars were much appreciated. And the steak lunch was terrific. We left about 3:00 PM with full stomachs and "all trained out" but very happy. Thanks very much for a most enjoyable time. I was wondering if there is a diagram of the BCW layout available anywhere. [Yes, see the Bitter Creek Western web site.] I have a train game that allows one to simulate layouts and I'd like to approximate the BCW if I were able. Again, many thanks. We'd like to come to the next Chew Choo Saturday next year.